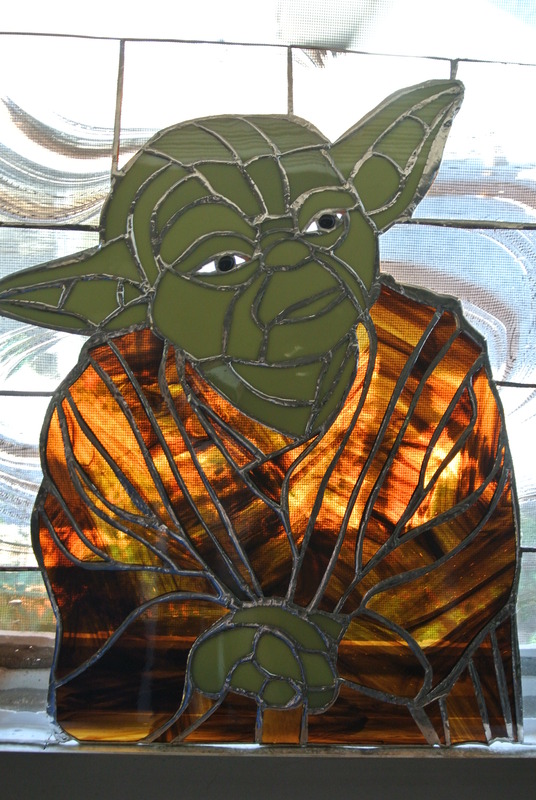 In an effort to reacquaint myself with stained glass and based on a comment that my art programs were “girly”, a Yoda stained glass piece was born! Having been out of doing stained glass for at least 6+ years, this was like learning how to ride a bike again…but I honestly had a great time doing it! I found a template online for this Yoda at http://www.yumeglass.com/Hobby/Pattern/index.html. This site has a ton of very cool options. I then got really lucky by being able to by the glass from a “rack pack” which offers 12″ x 12″ squares of glass for a reduced price at Muk Luk Magpies Stained Glass Emporium. So overall it wasn’t too pricey for my first project back. I think he turned out to be pretty cool. So what I am thinking of doing is an auction for him, with any proceeds made going into Mandala Art Centre’s Scholarship Fund. The scholarship will be set up to raise funds so that those who cant necessarily afford an art program can apply to have their program covered through our fundraising efforts. I will of course post more info on bidding on this stained glass piece. Just wanted to share it with all of you…what do you think of it?